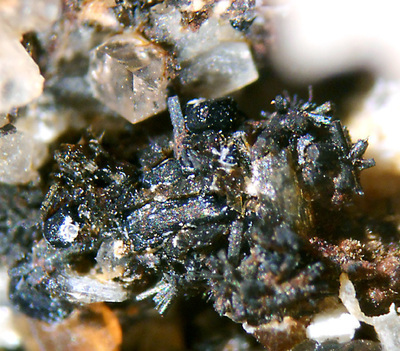 Sanidine ejecta from a pyroclastic explosive level. 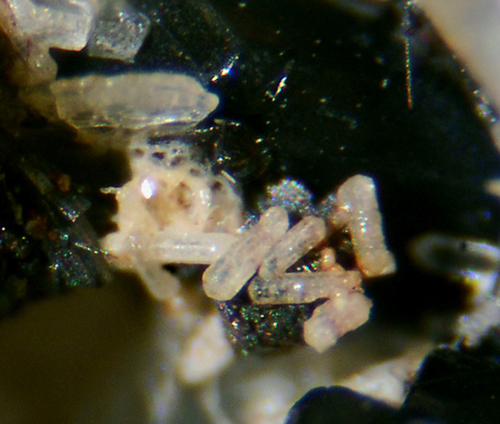 Abundant peprossiite-(Ce) has been reported from a sanidine ejectum, found near the road named Strada di Valle Cesate, on the southern fringe of Botte village (Calvario et al., 1993). 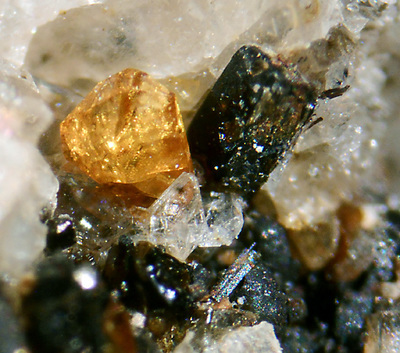 Peprossiite-(Ce), as aggregates of yellow hexagonal plates, is associated with hematite, black tourmaline, amber-coloured mica, fluorite, monazite-(Ce), thorite, and zircon. 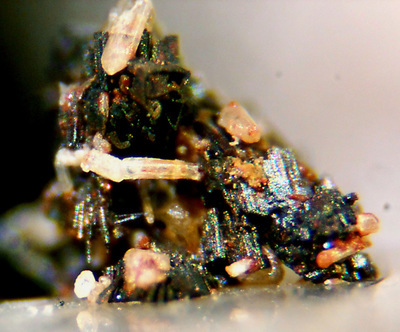 These peprossiite-(Ce) crystals contain uranium and a higher amount of thorium, compared to the ones of the holotype from Monte Cavalluccio (Sacrofano). Later studies on these crystals brought about the redefinition of the species (Callegari et al., 2000). 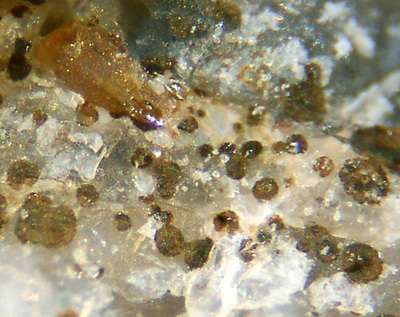 Furthermore, the tiny yellow crystals of monazite-(Ce), or better a solid solution between monazite and huttonite, from this ejectum represent the first find of the mineral in its mother rock for Latium (Della Ventura et al., 1996). 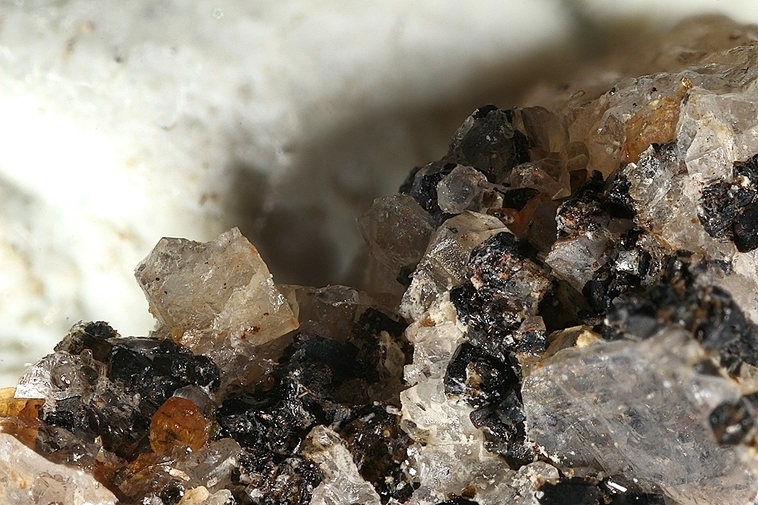 An interesting find of piergorite-(Ce) has been reported from a sanidine ejectum found along the road named Strada di Valle Cesate (Pucci, 2007). 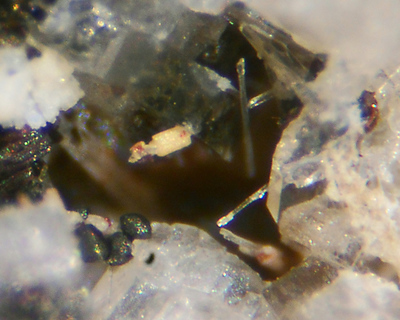 Piergorite-(Ce) crystals from this ejectum are different in appearance from those of the holotype, found at Tre Croci. 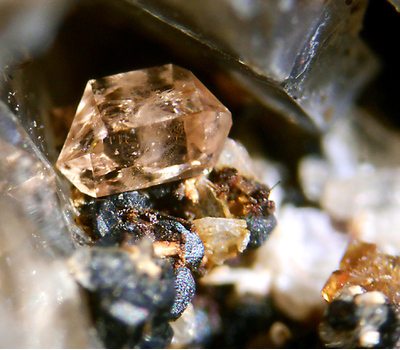 Their color ranges from amber to whitish; only a few crystals exhibit the typical tabular form of the hellandite-group minerals, while most of them show an elongated, almost prismatic shape and often form L-shaped contact twins on (301-) or multiple twins aligned along a rectangle's perimeter. Reference: Della Ventura, G., Mottana, A., Parodi, G.C., Raudsepp, M., Bellatreccia, F., Caprilli, E., Rossi, P., Fiori, S. (1996) Monazite-huttonite solid-solutions from the Vico Volcanic Complex, Latium, Italy. 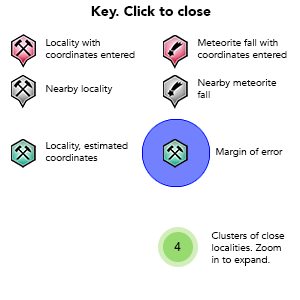 Mineralogical Magazine, 60, 402, 751-758. 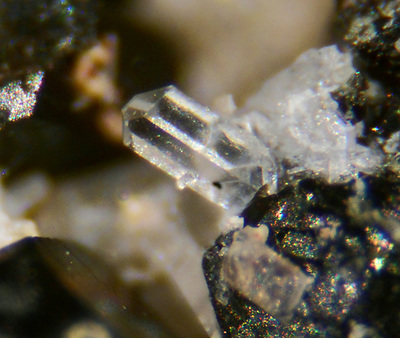 Reference: Pucci, R. (2007): Due nuove specie mineralogiche laziali: alloriite e piergorite-(Ce). Il Cercapietre, 1-2/2007, 24-40. 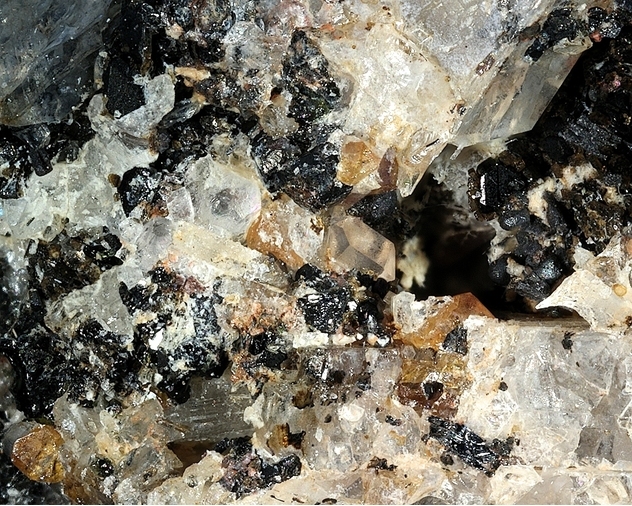 Calvario, F., Carloni, L., Fiori, S., and Pucci, R. (1993) Nuovi ritrovamenti mineralogici nel Lazio. Il Cercapietre, 20, 31-34. Bellatreccia, F. (1994) Minerali di Terre Rare nel Lazio. Il Cercapietre, 21, 11-19. 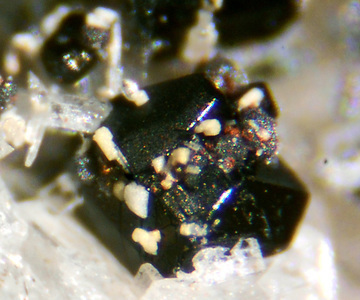 Della Ventura, G., Mottana, A., Parodi, G.C., Raudsepp, M., Bellatreccia, F., Caprilli, E., Rossi, P., and Fiori, S. (1996) Monazite-huttonite solid-solutions from the Vico Volcanic Complex, Latium, Italy. Mineralogical Magazine, 60(402), 751-758. 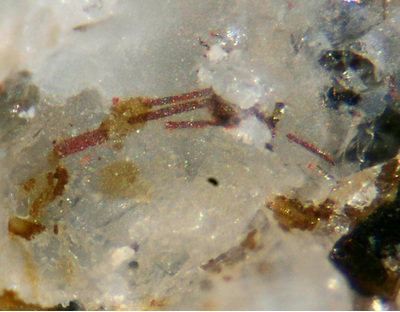 Pucci, R. (2007) Due nuove specie mineralogiche laziali: alloriite e piergorite-(Ce). Il Cercapietre, 1-2/2007, 24-40. Callegari, A., Caucia, F., Mazzi, F., Oberti, R., Ottolini, L., and Ungaretti, L. (2000) The crystal structure of peprossiite-(Ce), an anhydrous REE and Al mica-like borate with square-pyramidal coordination for Al. 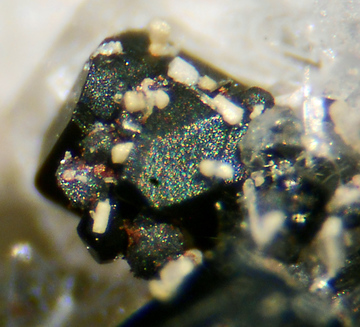 American Mineralogist, 85, 586-593.